Greenpeace can get a little aggressive with its tactics. That doesn't mean that it's not fighting for a good cause! But after the organization marched through the sacred Nazca Lines etched into the Peruvian desert for a climate protest, capturing it all on camera with a drone, you have to wonder what the hell they were thinking. Greenpeace isn't the best at thinking things through, though. In fact, this is far from the first time Greenpeace has screwed up, though this latest episode of Greenpeace Being Reckless is particularly atrocious. The environmental group has a long, long history of insensitive or poorly-staged actions, ranging from big—like helping to destroy a GMO crop designed to prevent blindness—to small—like papering a small town with posters the day after a community cleanup. In case you missed io9's post about the outrage, here's a recap: The environmental activists wanted to send a message to government officials from around with world who are attending a climate change conference in Lima this week. 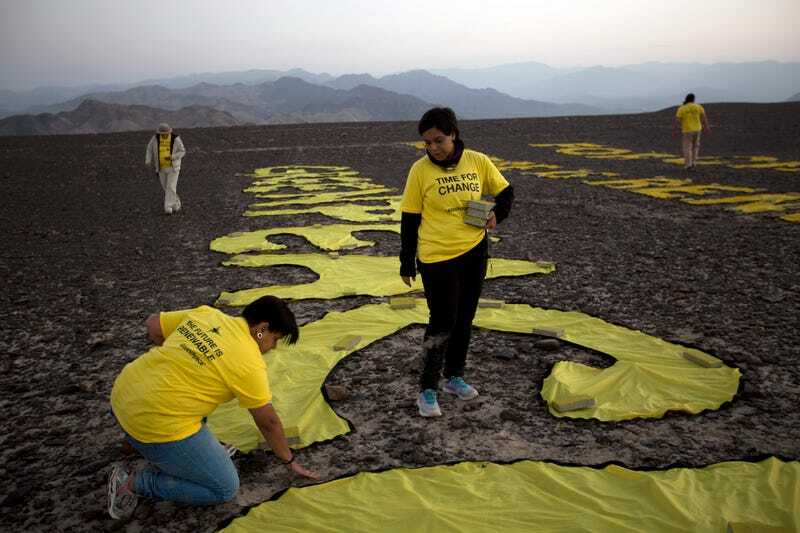 So they headed to the Nazca Desert, one of the most famous and archaeologically significant sites in Peru, to lay down a bunch of yellow banners that spelled out: "TIME FOR CHANGE! THE FUTURE IS RENEWABLE! GREENPEACE." The message is practically on top of the hummingbird geoglyph, which is now surrounded by their footprints. And the irony is thick. The future may be renewable, but these fragile, ancient drawings are not. "This has been done without any respect for our laws," Peru's deputy minister for culture Luis Jaime Castillo told the press, calling Greenpeace's actions "thoughtless, insensitive, illegal, irresponsible and absolutely pre-meditated." He explained further: "It was done in the middle of the night. They went ahead and stepped on our hummingbird, and looking at the pictures we can see there's very severe damage. Nobody can go on these lines without permission—not even the president of Peru!" Aside from the blatant insensitivity at play, the reason Greenpeace's actions were so atrocious has everything to do with how fragile the drawings and surrounding ecosystem are. The Nazca drawings, a UNESCO World Heritage Site, date back to between 400 and 650 AD, when the area was inhabited by the ancient Nazca culture. The Nazca people created them by digging long, shallow trenches that became figures—spiders, monkeys, fish, birds, etc.—when viewed from above. They stand out from the rest of the landscape because the gravel on top of the soil is dark, but when the rocks are removed, light-colored clay is exposed. Greenpeace activists stomping around the drawings is kind of like walking on a Mondrian painting while it was still wet. While most of the hummingbird form itself appears to be intact, the footprints uncovered the light soil underneath, wrecking the once pristine archaeological site. Greenpeace did trod on one of the lines. As Patricio Murillo points out in a blog post about the tragic destruction, folks like researchers wear special shoes to avoid leaving traces. And as you can see above, the Greenpeace activists just wore regular old sneakers. Because why bother researching how to treat a sacred site when you want to dump your organization's advertisement on top of it and take drone selfies. "[The drawings] are absolutely fragile. They are black rocks on a white background. You walk there and the footprint is going to last hundreds or thousands of years," Castillo said. "And the line that they have destroyed is the most visible and most recognized of all." Greenpeace is sorry. Nevertheless, Peru is opening a criminal investigation and trying to keep the activists from leaving the country. The country says it will press charges of "attacking archaeological monuments" that are punishable by up to six years in prison. Greenpeace is really sorry. This is far from the first time Greenpeace has gotten in trouble for doing something dumb. The organization actually does this kind of thing not infrequently. Back in 2006, Greenpeace caused a big stink about how electronics were polluting the environment, but then it turned out that their report on which companies was the worst distorted the facts significantly. This is around the same time that they also took flak for being a bunch of luddites, crowing about how technology was ruining the world. And then there was the time they tried to tell the native people of Greenland what they should eat.